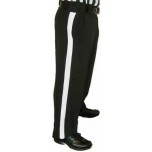 We feature NFL style football referee pants and shorts with a standard 1 1/4 inch stripe approved at the college and high school levels. Choose pants from standard polyester fabric from Smitty or premium 4-way stretch poly/spandex blend from Smitty. Smitty's standard styles are value-priced for any budget and offer lighther fabic for warm weather or thicker water-resistant styles for cold/foul weather. 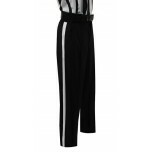 Out of all the clothing for officiating I own, these referee pants are my favorite. They're very light and athletic looking, and have a crease in them. These pants are a step above any other pants on the market. They're fantastic for warm weather. Ordered and received these pants in time to wear them in a state final. Was impressed with the quality and comfort of these pants. I highly recommend them! These football referee pants are very comfortable. Will be buying more of these for the rest of my crew.